This is without a doubt the most obscure and just plain horrible translation I’ve found so far for my Lost in Translation Series. What sets this translation, found on a card at a Düsseldorf International Airport bistro, apart, is that I can’t see how the translation came about! Some translation program or reference book must have translated “Ausgabe” to “version!” To give the translator credit, or perhaps simply pity, the standard translations of this word won’t work for this usage. 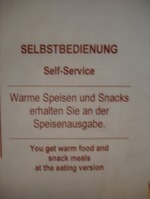 When I entered “Ausgabe” into my translation widget, it spit out “output.” Altavista Babelfish gave me “expenditure.” Yet another site gave me “issue.” None of these come close to what the sign is trying to say, namely that warm food and “snack meals” (hahah, didn’t even notice that!) are available at the counter where food is served. Wow, just about everything is wrong with translation! There’s an “eating version” that serves “snack meals” and the sentence starts with “You get,” which you might find at a small Southern U.S. airport as well! Ahhhh, the Wiener Linien… Perpetrators of two out of the three sightings involved in my “Lost in Translation” series so far. Here’s the third, and possibly worst one! “Happy New Jear”!? Everyone knows this… Come on! 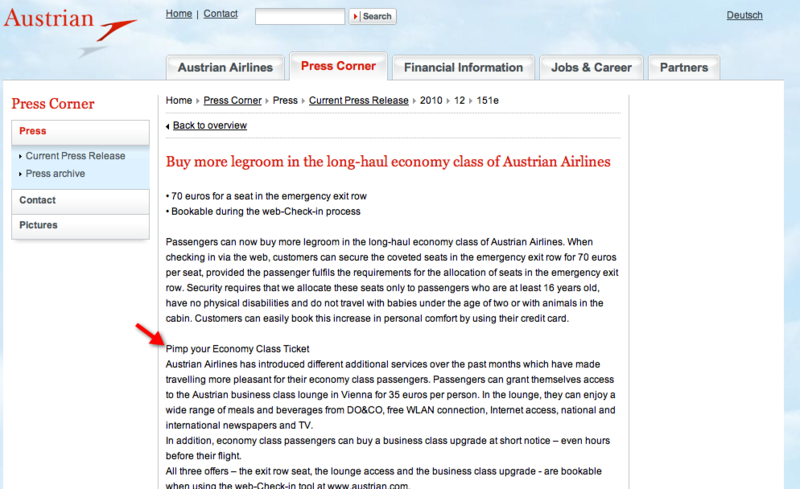 You could have given all eight million plus Austrians a multiple choice quiz on this one and I bet you at least six million would have done a better job than the operators of the Wiener Linien’s departure monitors! There’s not more to say about this one… Simply enjoy! 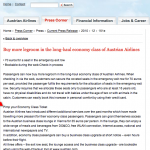 Oh wait… There is one more thing to note… The Wiener Linien have over 8,000 employees, and, together with its parent organization, Wiener Stadtwerke Holding AG, there are over 14,000 employees. Yep, it’s quite an embarrassment that they don’t have a qualified English language proofreader! Today my friend Kathi sent me a photo she took with her cell phone of another translation that obviously did not pass too many English-enlightened copyeditors before hitting the streets. It’s a poster advertising a special tram service run or sponsored by a bakery chain during the holiday season. 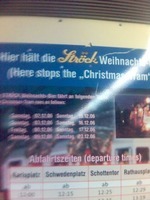 What should read “The ‘Christmas Tram’ Stops Here” has been sloppily translated to “Here stops the ‘Christmas Tram'”. Many Viennese speak great English. Had this ad passed through more than two or three hands before it was posted all around town, someone would have probably caught the mistake. But apparently that would have required too much effort. Update: It turns out the Wiener Linien are responsible for this sign as well… Who would have thought!? I see so many ridiculously hilarious signs and posters in Vienna on a daily basis that I’ve decided to start a series on this very topic right here on my weblog. My first sign is this sticker that was posted in nearly every metro car here in Vienna, as well as many buses and trams that would be affected by the subject of this sticker. Basically, Gumpendorfer Straße, a stop on the U6 metro line is closed all summer for renovations. 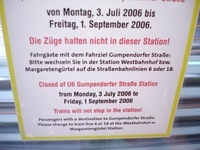 This message in German was translated into English as “Closed of U6 Station Gumpendorfer Straße”! Apparently the Wiener Linien (Vienna Transit Lines) didn’t consult a native speaker or expert of the English language to translate this message! Almost all of the original stickers have been replaced, but I occasionally still encounter them.